A ducted heat recovery unit for internal rooms. Self-contained and includes two mixed flow speed controllable fans. Using a high performance, polymeric heat exchange cube together with two power fans, the HR200V can boast a temperature efficiency of up to 70%. Low speed for trickle ventilation mode. 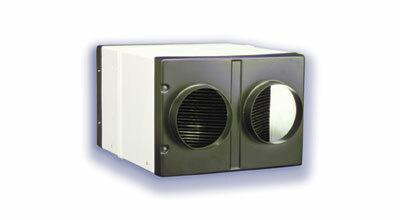 Specially designed to provide ventilation for small internal rooms in commercial, educational and leisure applications. Ventilation is achieved by using nominal 150mm diameter flexible ducting. The unit is completely self contained and includes two mixed flow speed controllable fans plus a high efficiency polymeric heat exchanger. HR200V is designed for mounting in a cupboard, a ceiling void or above a suspended ceiling. Four spigots are provided for simple connection to 150mm flexible ducting. When passing through an unheated area insulated ducting should be used. A ducted heat recovery unit for internal rooms. Self-contained and includes two mixed flow speed controllable fans. Using a high performance, polymeric heat exchange cube together with two power fans, the HR200V can boast a temperature efficiency of up to 70%. Low speed for trickle ventilation mode. Specially designed to provide ventilation for small internal rooms in commercial, educational and leisure applications. Ventilation is achieved by using nominal 150mm diameter flexible ducting. The unit is completely self contained and includes two mixed flow speed controllable fans plus a high efficiency polymeric heat exchanger.